Of course, my mom didn´t allow us to take anything that didn´t belong to us. But I did. I took two green sweet passionfruit and hid them in a cool and dark spot. As it was my usual spot to play, after a few days, unexpectedly, I found them totally ripe and...sweet. So I learned that green fruit may become ripe away from its tree - it was unknown to me. A big finding for someone who only picked ripe fruits. 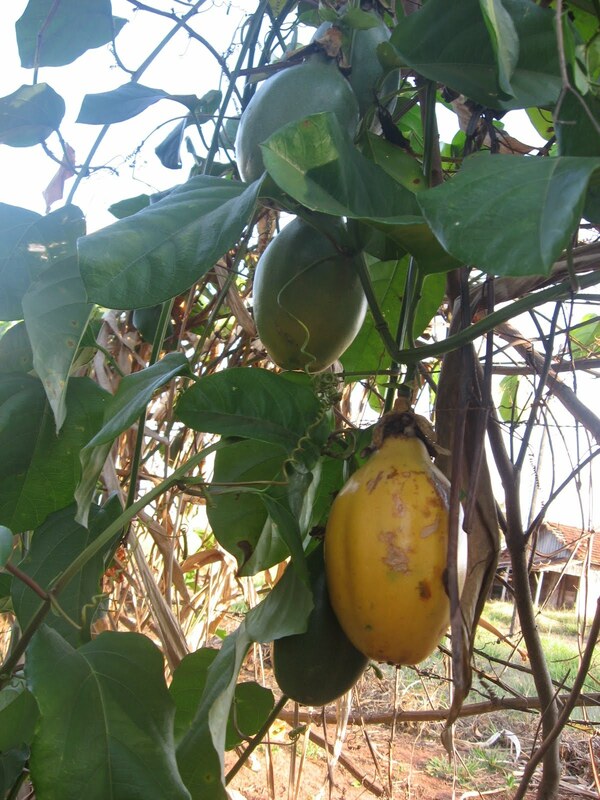 Even though we may find sweet passionfruit growing in many places, it is not largely sold in markets. After that episode, I ate again many years later, bought at the produce market in Sao Paulo city. In America? I don´t remember having eaten any, so whenever I came to visit, I would buy several and gorge on them. 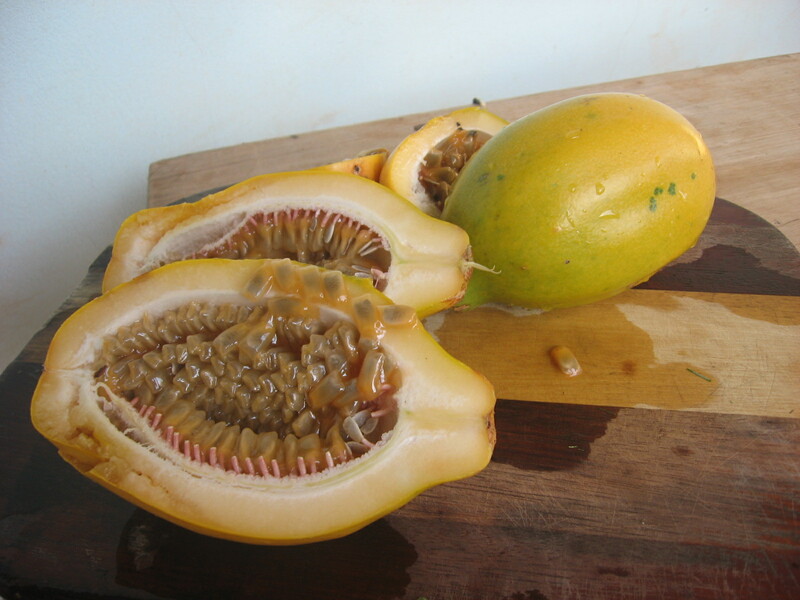 As a matter of fact, the edible part is the jelly like pulp and the seeds. We don´t chew seeds, or they will sour your mouth. 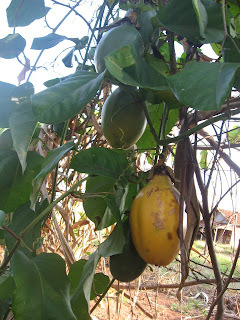 This kind of passionfruit is eaten as a fruit, different from the "juice kind" which is rounder and pale yellow, and easily found in the market. The juice kind is sour, yet, very popular for juice making. You will need to mix with water and lots of sugar, just like lemonade. You may try to mix the pure juice with cold black tea and sweet condensed milk. It´s a deep, smoky, creamy, sweet with a hint of acidity and very fragrant drink that it is almost a dessert by itself. Brazilians like to use passionfruit (the juice kind) to make mousses, jello, creams, you name it. Use it as would lemon. Just sieve the juice and discard seeds. For juice, blend together the pulp with seeds, sugar and cold water. It is known to have very calming effect. There is even some herbal medicine made from it. If you want to see its beautiful exotic looking flower, please check May 17, 2010 - April Reviewed blog.